The Net Diagramming Extension Pack is a free add-on to EDGE Diagrammer. It includes symbols, samples, and diagram templates to add network diagramming to the basic capabilities of EDGE Diagrammer. 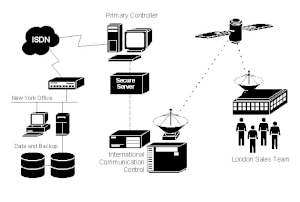 It includes all necessary symbols, clipart, samples, and diagram templates for designing diagrams of computer networks, LANs, WANs, data and voice communications systems. You can download and install this extension pack free if you have purchased a license or even if you are just evaluating the free trial version. The package includes a variety of symbols for computers, printers, servers, routers, hubs, bridges, phones, gateways, directors, repeaters, cables, wiring, and more. The symbols come in several styles to suit a range of diagramming purposes. 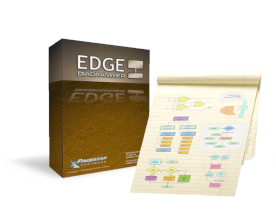 In addition to the simple network diagramming symbols provided as part of the standard EDGE Diagrammer product, the Extension Pack adds three-dimensional symbol sets duplicated in gray-scale and black and white. The symbol sets contain symbolic representations of the most common networking devices and recognizable facsimiles of hardware components. The presentation symbol set contains 3D grayscale graphic symbols ideal for presentations and proposals. They are similar to the standard notation symbols that were introduced by Cisco Systems for the Cisco Career Certification Program and originally documented in the book Designing Cisco Networks (Cisco Press 1999). The documentation symbol set is identical to the presentation set but reduced to black and white. These symbols are especially useful for documentation that will be printable on standard black ink and lower resolution printers. Cisco Systems is widely recognized as the global leader in networking for the internet. As industry leaders, the notation they choose qualifies as a de facto industry standard. Our unique symbols are well-suited for expressing and extending this standard notation. The Net diagramming Extension Pack contains the following components. 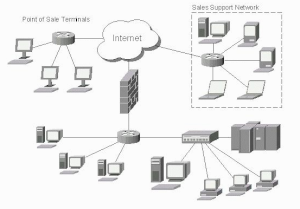 It includes the standard networking symbols and templates distributed with the main product. They are included here so that updates and extensions can be added in the future. The extension pack also includes over 100 clipart images of new 3D symbols. 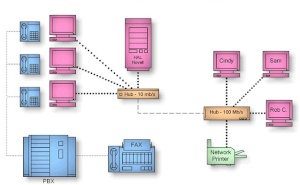 The clipart can be used on its own or from within the network diagramming templates. There are a set of four templates of different sizes for creating presentation quality diagrams of different levels of detail. Another four templates contain the documentation symbol set in the same sizes. Also included are a number of sample diagrams showing possible ways to use the templates to create great diagrams.